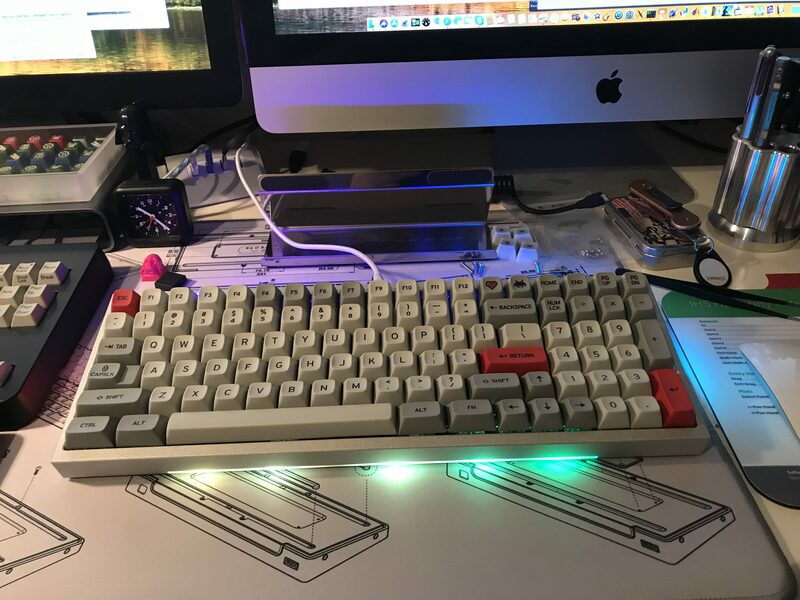 after a long IC phase I'm finally starting the GroupBuy for my custom case. I don't want to write a lot about concept, construction, design and features, since I already did this quite extensively in the IC opening post and throughout the discussion there. I'll summarize, do some c&p and add what's necessary. 2018.09.11: payment phase extended until beginning of Oktober in order to to give more to compensate for those who don't pay. Awaiting 60WKL & 75 samples, they should help to convince a few more to join and get to the expected number. 2018.09.06: payment status update, many still missing, link to post. 2018.08.07: participants should check their spam folder. info email was sent out a few days ago. Invoices are out now. Orders are still accepted until the end of payment phase, beginning of September. 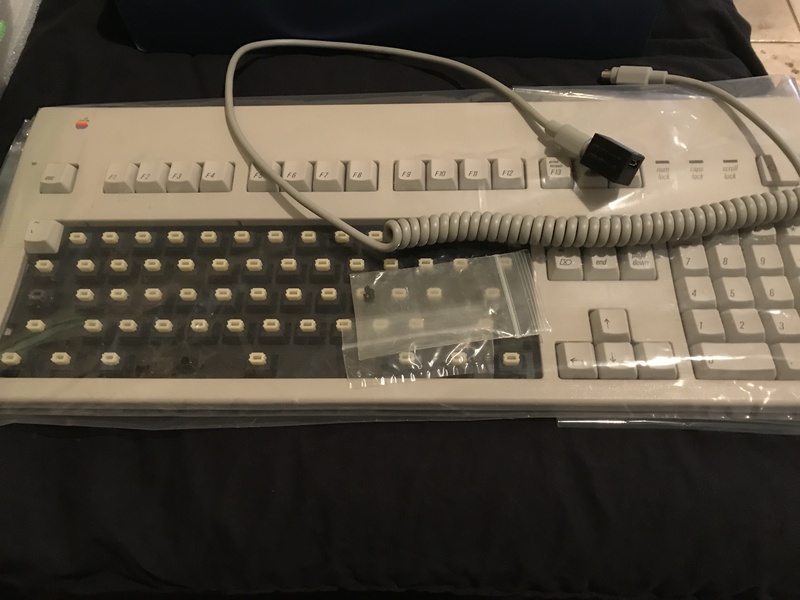 This is a GB for a high profile, top-mount, custom keyboard case. It is made of thick, bent aluminium. The surface is bead blasted and black anodized. The plate is black galvanized steel. 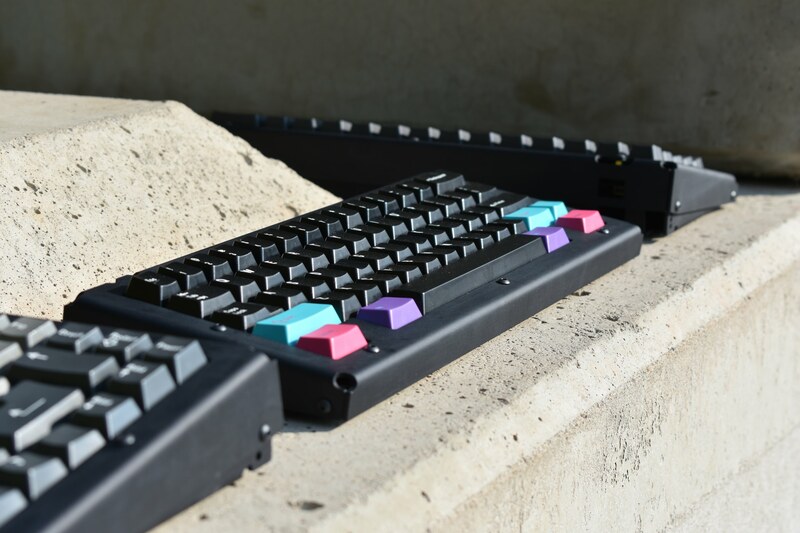 You can choose between different 60% versions (Standard, Winkeyless, HHKB and YAS) as well as a 65% and a 75% version. 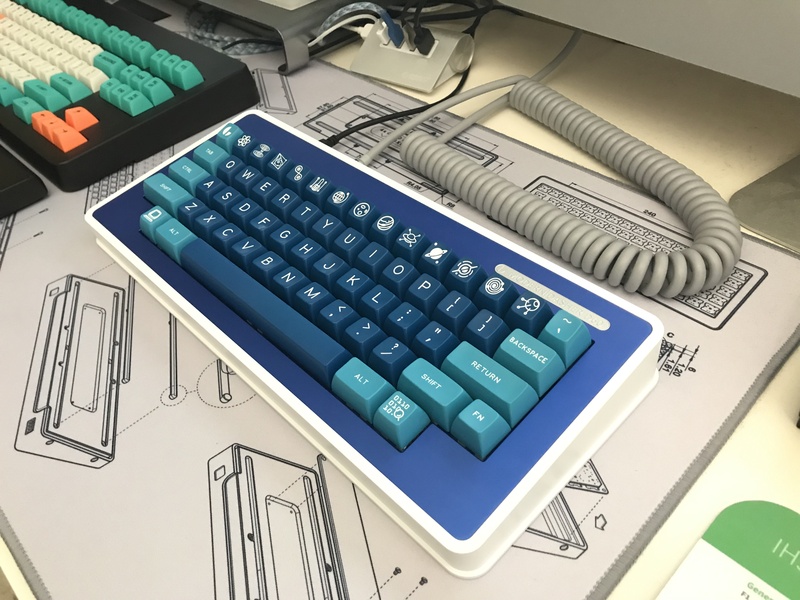 You just get the case, plate and accessories like screws but no PCB (except for the YAS version, there you can order the case with the PCB if you like). 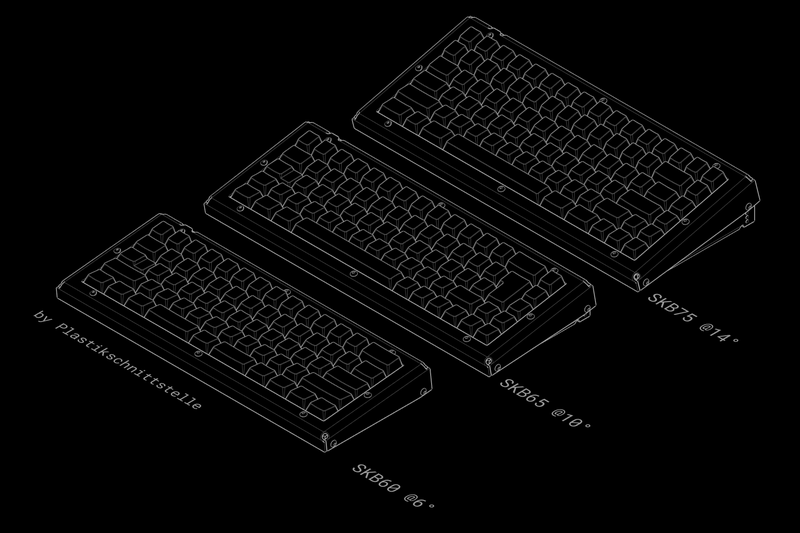 All popular 60%, 65% and 75% PCBs are supported. It is made in Germany. Shipping world wide. 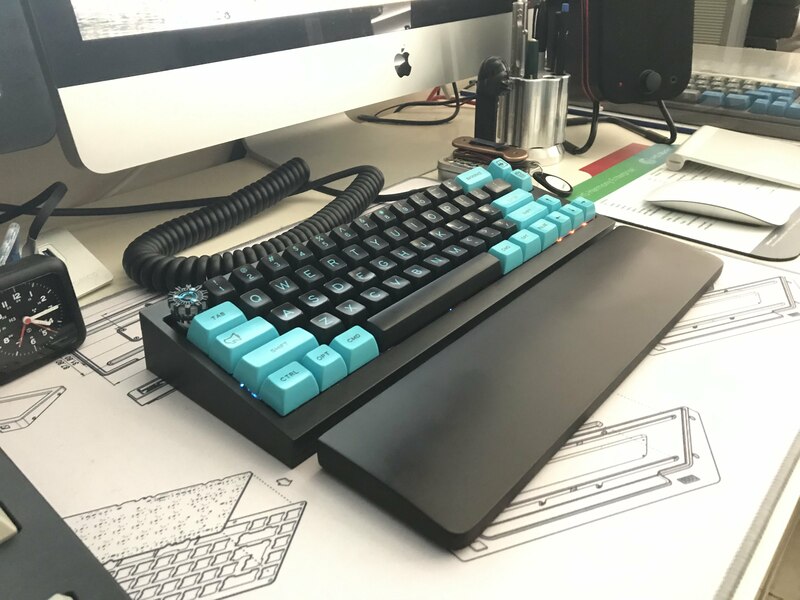 You can find a lot of custom keyboard cases here. They are CNC milled, which is awesome but quite expensive as well. 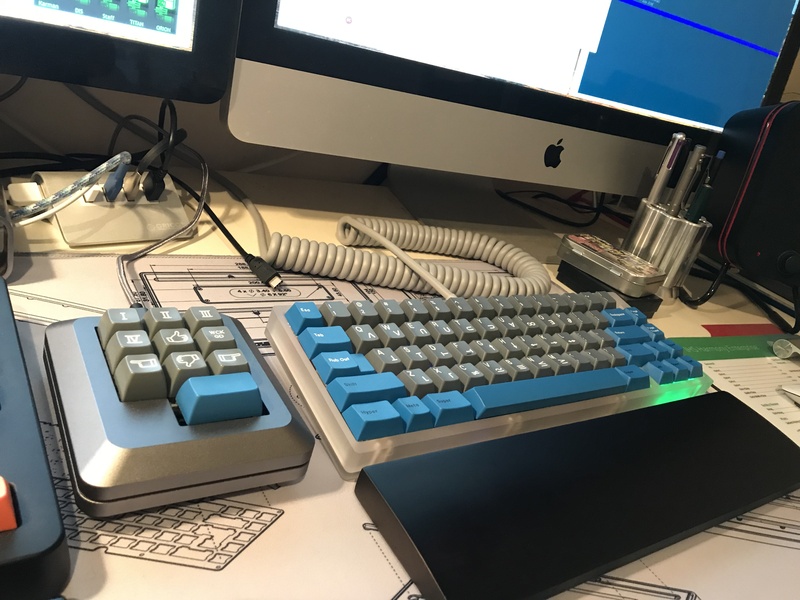 I wanted to provide an alternative that gives you all the benefits of a solid aluminium keyboard but for a considerably lower price. 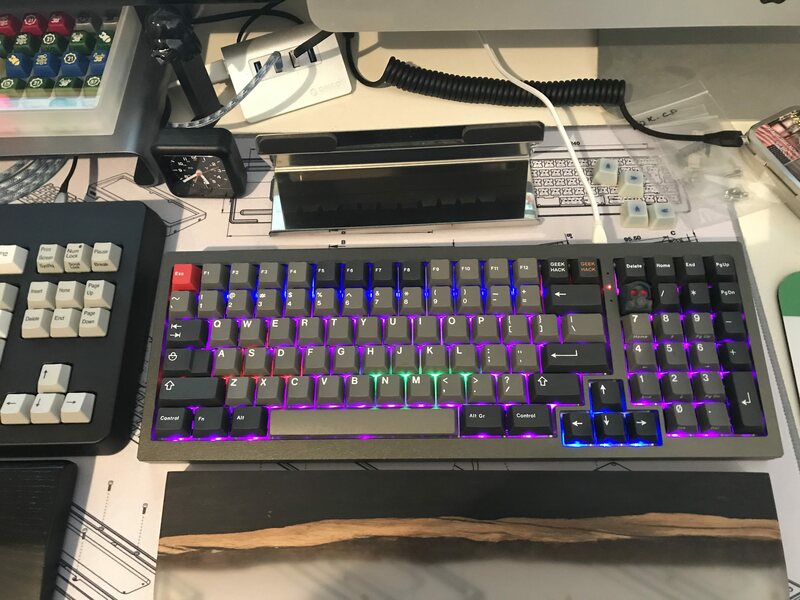 So instead of milling the parts of the keyboard from a block, I decided to go for laser cutting and bending thick sheets. The design is simple. The decision for a material thickness of 3mm 2mm in combination with the plate mounting method and the bolts piercing through the frame lead to a pretty wide frame. The sides overlapping at the edges is a deliberate choice which should emphasize on the method of folding, rather then trying to hide it. It also exposes the thickness of the material. Some of you described it as "brutalist", "utilitarian" or "industrial" - all undeniable true in some way. I like to view it as a robust and reliable, everyday tool with a focus on typing experience and ergonomics. Secondly, the first and lowest or "initial" key row should be as low as possible. This is illustrated in one of the pictures down below. Thirdly, height adjustability. 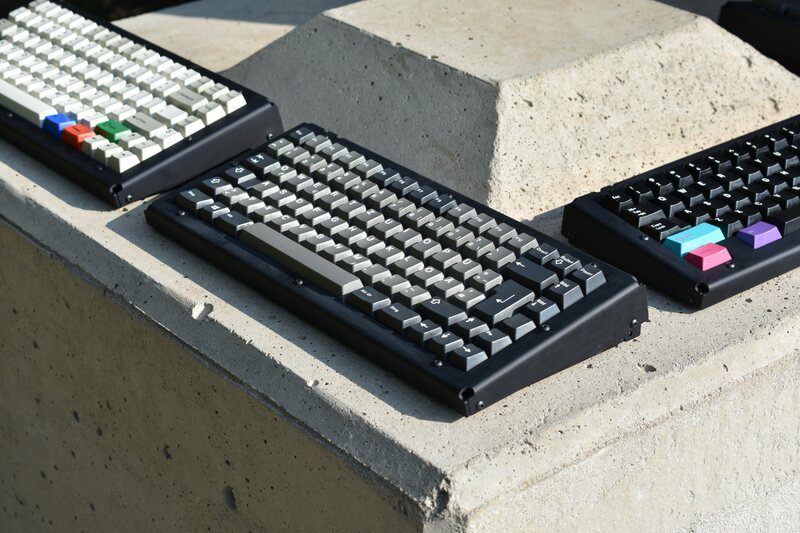 We prefer our keyboard at a certain angle but not everybody likes the same. So I wanted height adjustability to be an integral part of the design. You can choose between different angles: 6, 8, 10, 12 and 14 degrees. 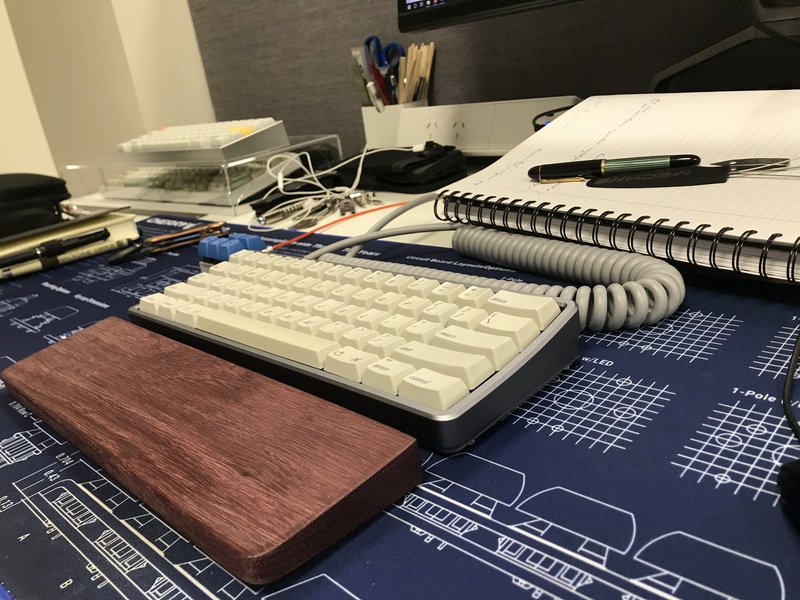 Though the first prototype wasn't a high profile case, the initial feedback I got, plus the IC made it obvious, that it would have to be a high profile case. 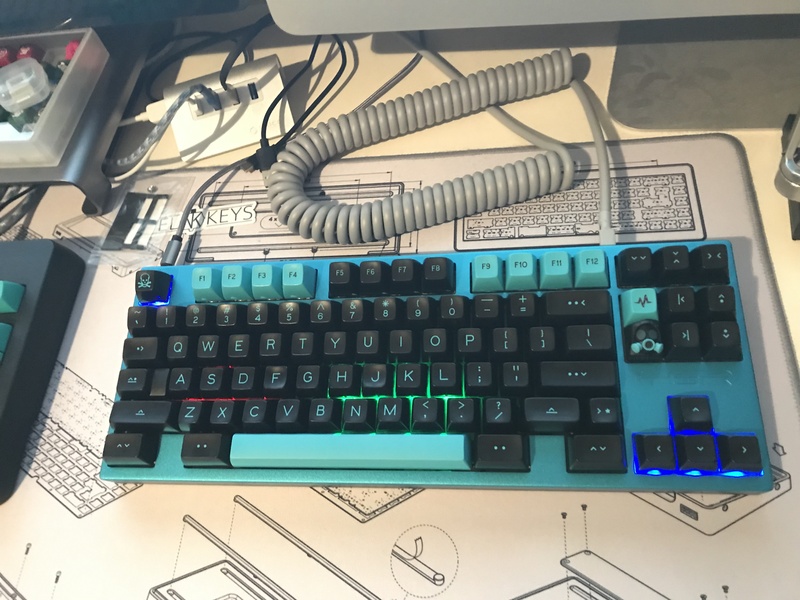 After making that decision, I wanted it to be a "really" high profile case, much like old keyboards. This means the bezel doesn't level with the lower edge of a cherry-profile keycap, instead it exceeds it by roughly 2mm (1,9mm measured in CAD). 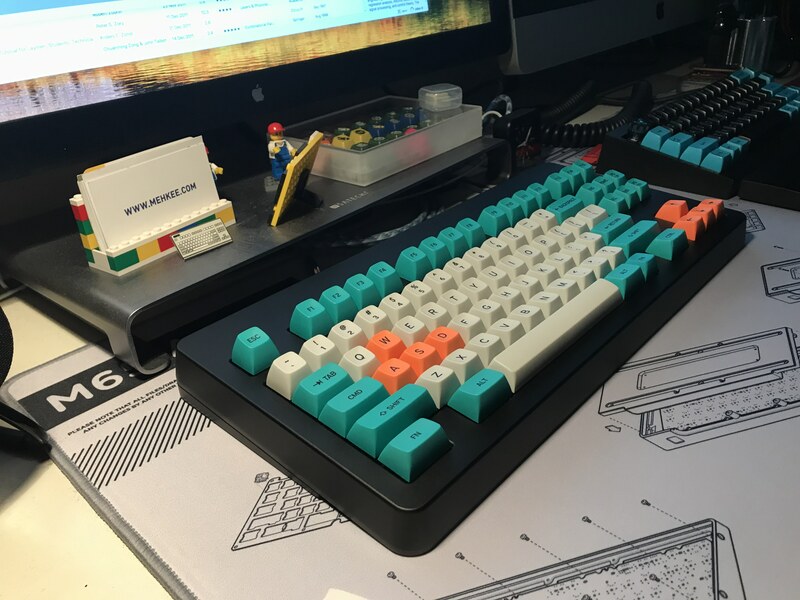 In other words, keycaps sink 3 mm deep into the frame. You can find much more information about the whole process and how we got here, by taking a look at the IC thread. Any of the popular PCBs with the USB port on the left side will fit. Don't bother about screw-hole positions on the PCB, this is totally irrelevant in this case because it is a top-mount construction, not a tray-mount. 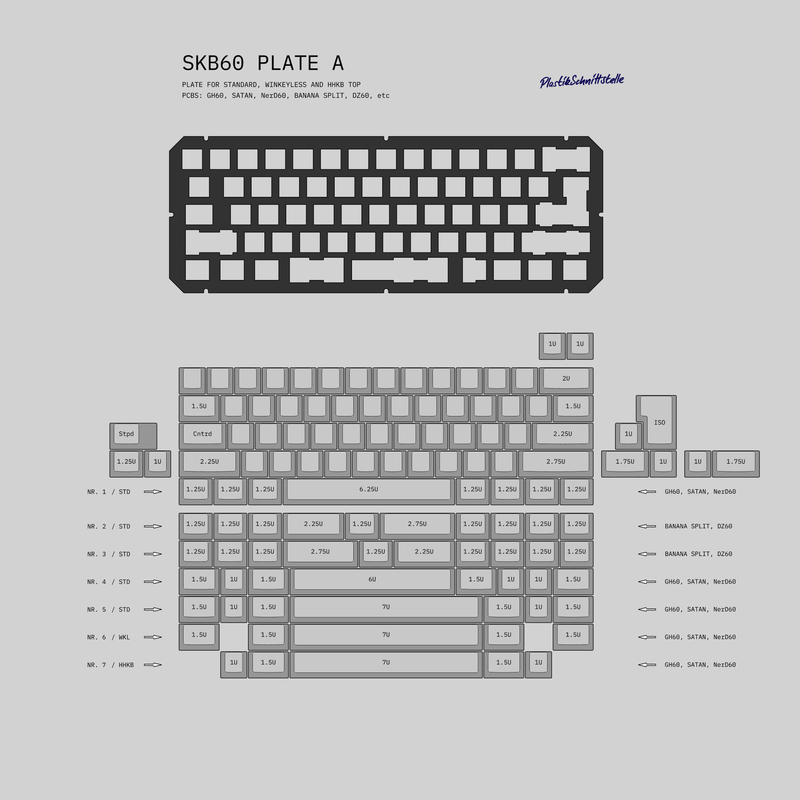 For the 60% there is plate A that supports most popular layouts including split spacebar. The YAS PCB gets its own plate. 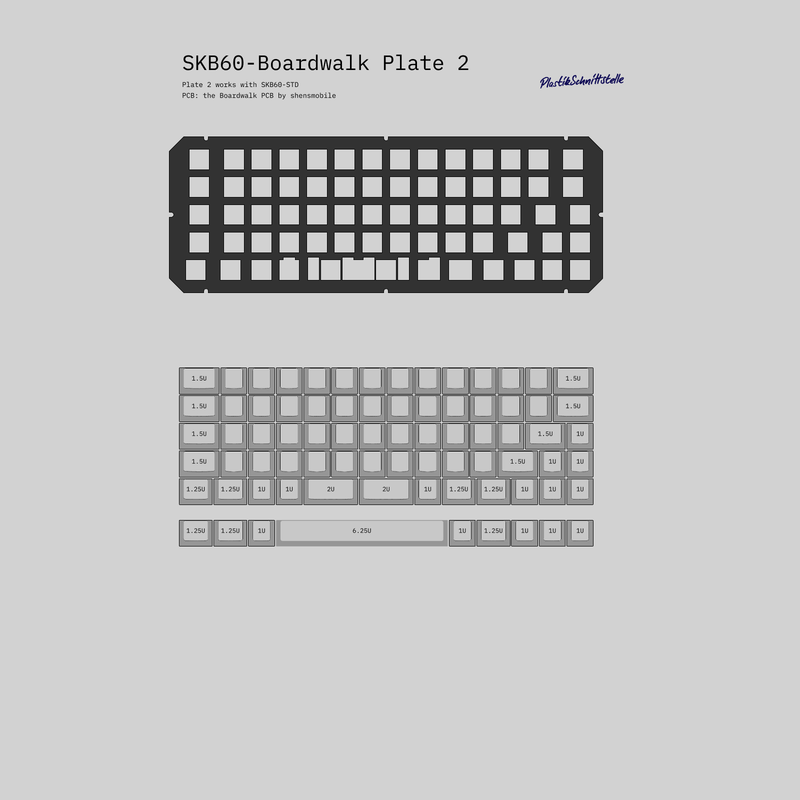 65% 75% each have one plate, both support split spacebar as well. Especially providing an option for the YAS62 - a project that I really like - was important to me. I have two of these PCBs and can't wait to finally put them to use. Silentreader still has some PCBs left that you can get, just PM him. The YAS PCBs will be sent to me. 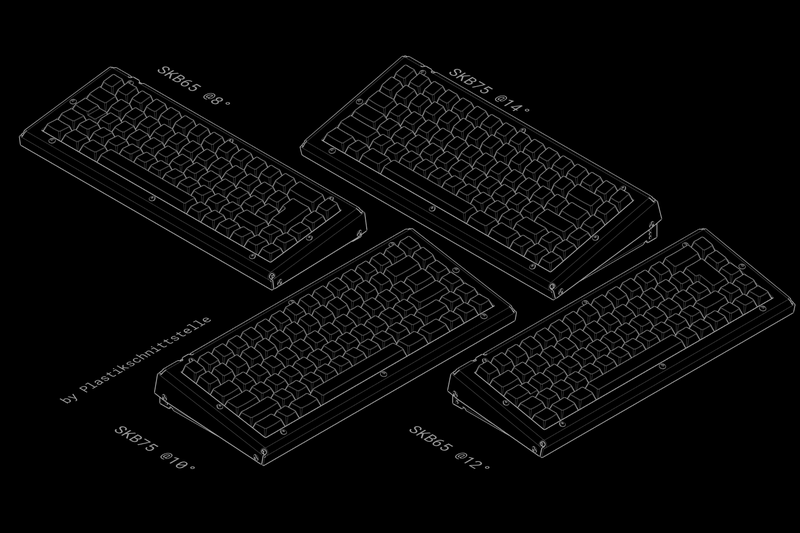 In the order form you have the option to add the YAS PCB to your order to get it from me together with the case. Price is 37€. All plates are ANSI/ISO unified and only support Cherry PCB mount stabilizers. I have added another plate option to choose from. 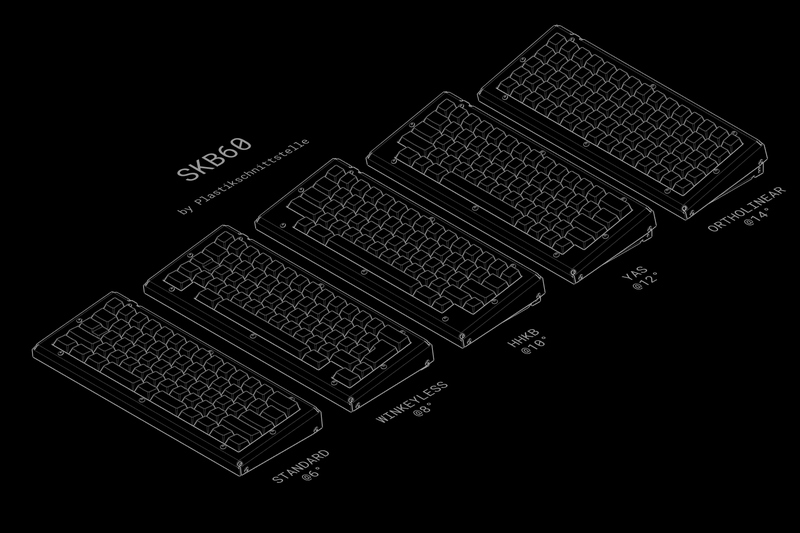 Now SKB60 is available with an ortholinear plate, which support the XD75 PCB for example. 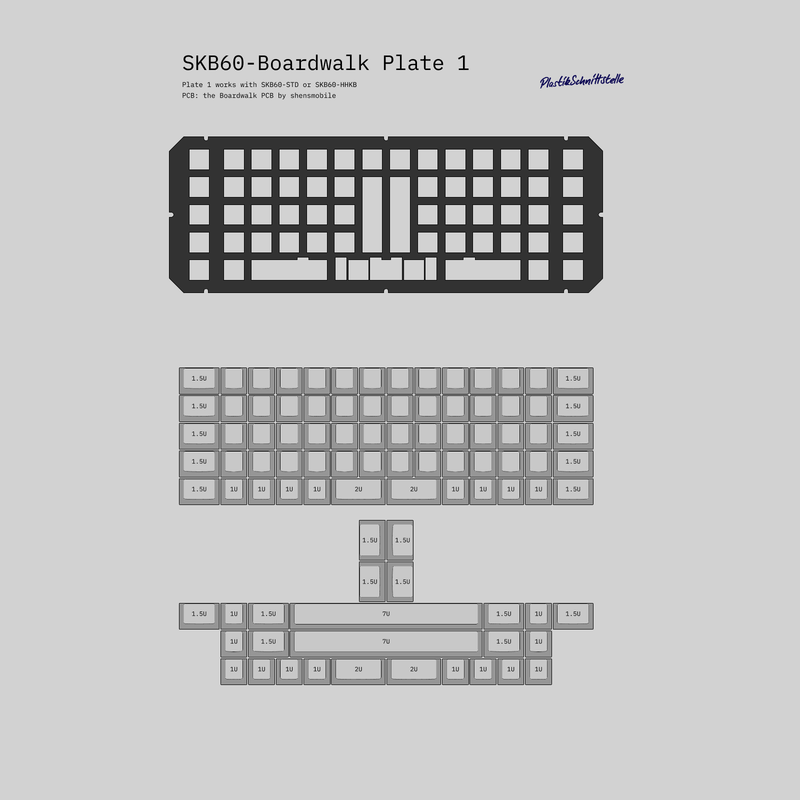 Small plate updates regarding split spacebar support. SKB65 now available as well. 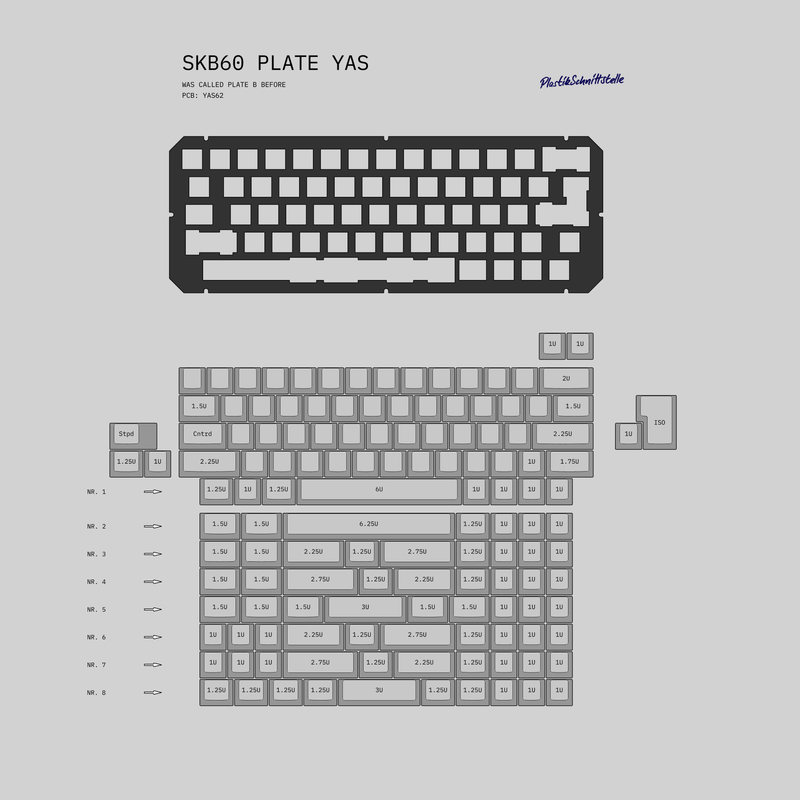 Dropped one layout -> YAS now has it's own, dedicated plate. BOARDWALK support added. Two different plates for Boardwalk, see pictures below and linked album here. Boardwalk options added to the order form. Height adjustment is not quick like flipp out feet. You have to unscrew two and loosen two more screws on the sides in order to adjust the height. There are a few mini-USB cables that have a pretty bulky head. The top left screw is positioned right above the USB port and if you happen to have a bulky plug, then it might interfere slightly with the screw inside the case. Not a big deal, I just sliced a bit off the plug and then it did fit perfectly fine. I now this since the first prototype but I didn't want to change the screw position, since I think it's perfect and slicing isn't a big deal. Some cables fit right away, some need the slice. The position of the USB port differs slightly on some PCBs. Depending on your PCB, the plug might not be perfectly centered in the cutout, but of course it will always fit. There are PCBs like the EEPW84 which have a little controller board (Kimera core) soldered on in the lowest row. This component might touch the bottom of the case. Because of that a PCB like this might not work at the lowest 6 degree angle (probably works but I can't confirm). Angles above 6 degree won't be any problem. I live in Germany and here we have plenty of companies that specialize in this kind of metalworking. I have designed parts which are laser cut and bent before and was always very satisfied with the result I got from the local companies. I trust them, communication is smooth and they deliver quickly. I will ship with DHL. Here you can find a detailed price table for international shipping from Germany. 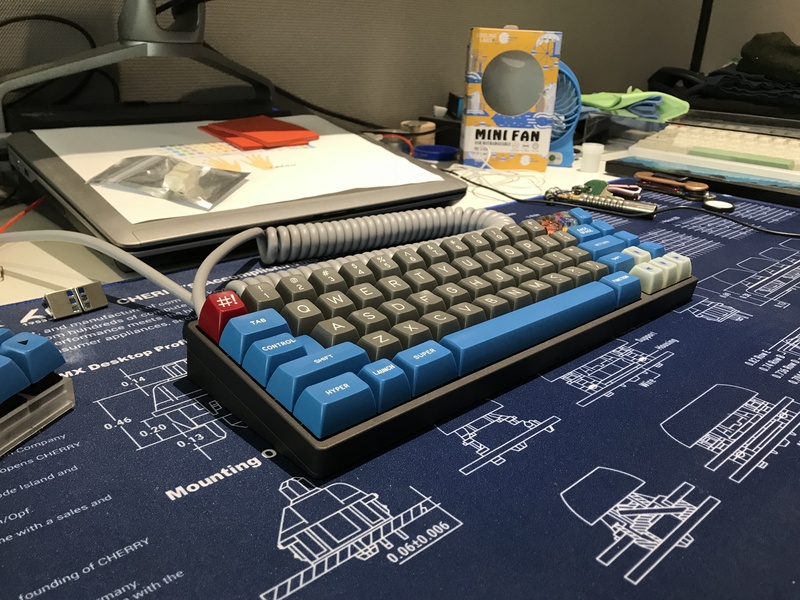 (2018-04-15) SKB60 case and YAS PCB shipping together? I want to make sure you know exactly what you are getting. Renderings can be misleading and I wanted you to be able to make a decision based on the real case. So I decided to get samples made. That pushed the GB back another two months but I thought it was worth it. 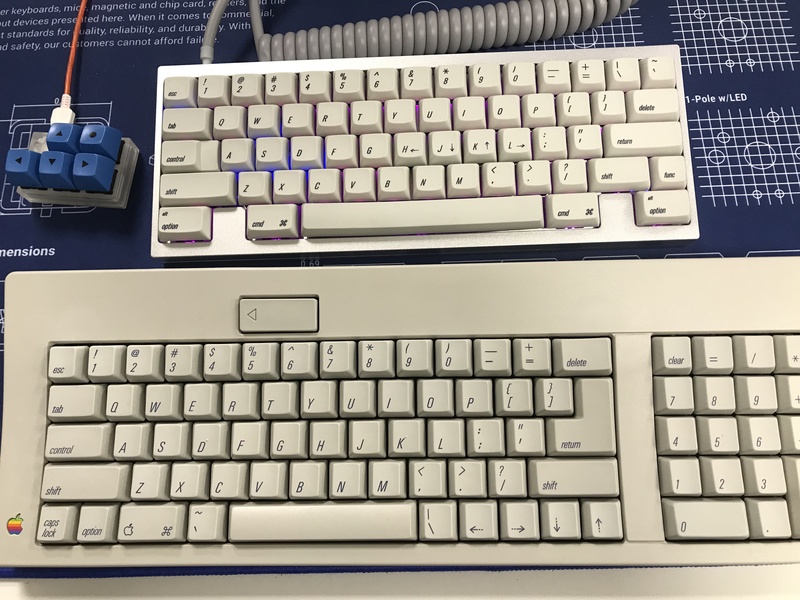 SKB60 standard and HHKB versions were made. Samples for all the different versions would have been too expensive for me. So there are renderings for some versions, but the impression you get from the samples translate to the rest. You can finde much more renderings in the IC. Sorry just lost my patience uploading pictures. I'll provide the renderings via external source link later. Most are shown in the IC already, just a few new ones. Here you can find new renderings. Finally! Sorry it took so long. 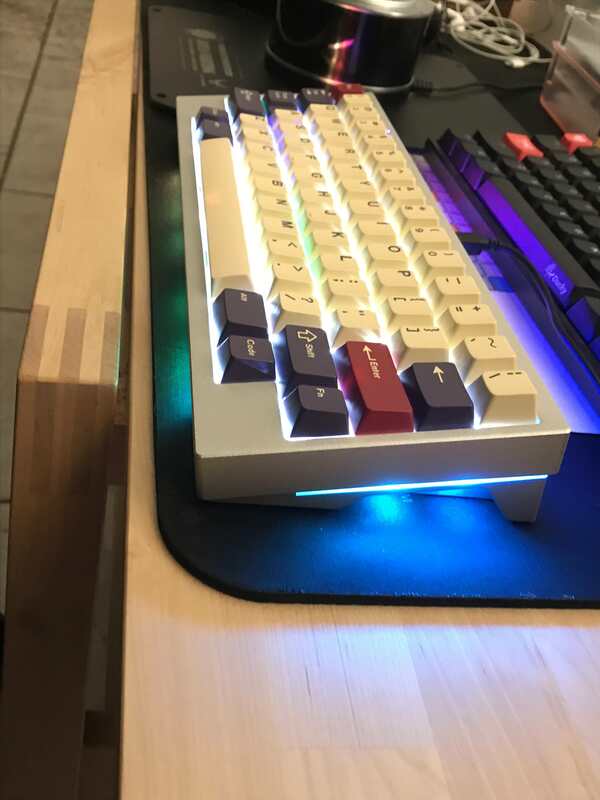 Still so much I wanted to get arranged before GB start, like better pictures, another build with other switches and a typingvideo. But there is always something missing. I'll add all this, step by step. Woohoo, I've been waiting for this one. In for at least the YAS. Finally Really excited for this! How many different versions did you buy? Made in Germany from bent metal. Only available in black. This has gotta be one of the coolest new boards I've seen in a while. 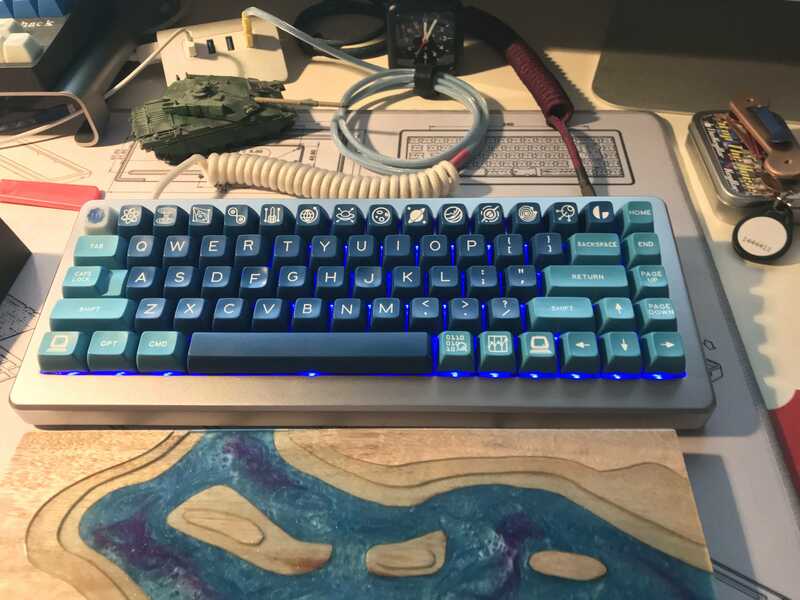 Wish I had keyboard money right now. Good luck with GB! In for 60% WKL. Let's go! Very excited for my first "Gustom"
I am in for one 75% case, and possibly more if you consider my request in the note section of the GB form! Ordered YAS 60%. 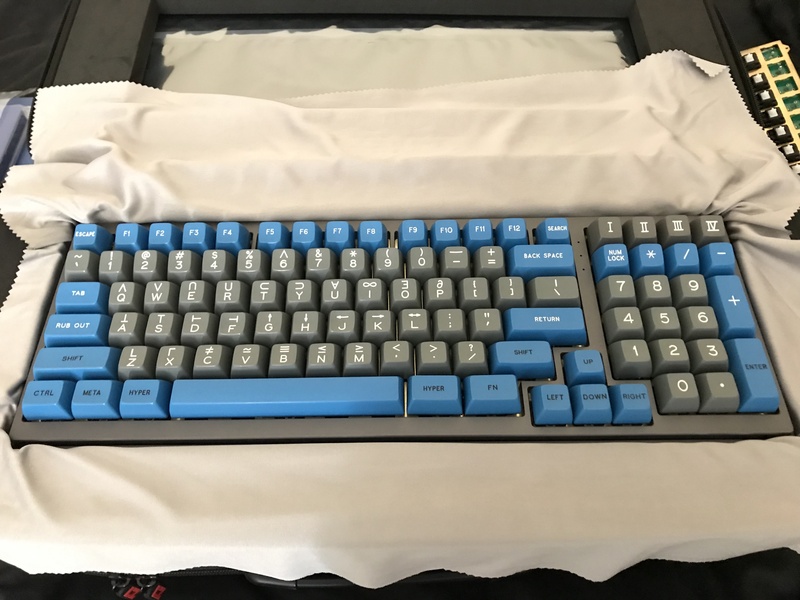 This will be my first German custom keyboard. Very exciting! Can you please, give us a choice of flat/flush screws, different colours screws will be great? ... Oh, I see no flush screws. HIT ME WITH THAT SKB75! I love how detailed and organized your post is. 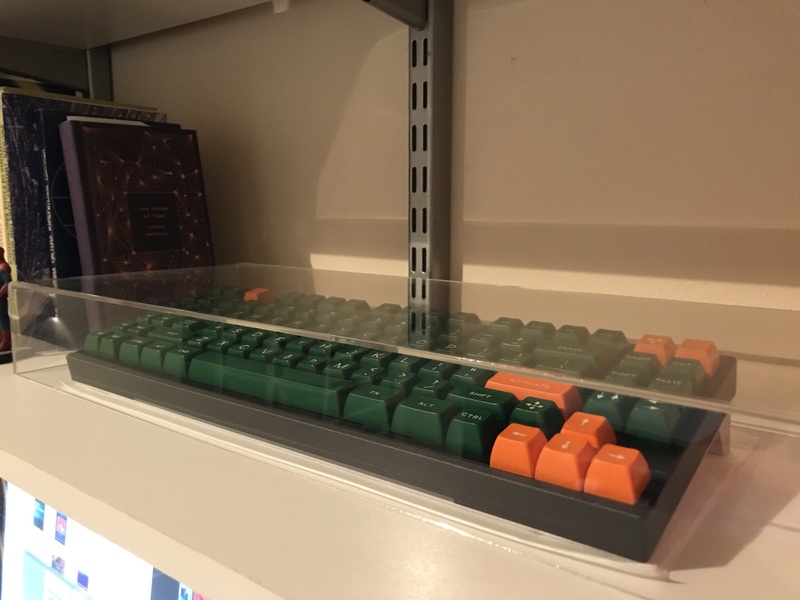 In for 60% HHKB! I feel like I’m being super thick here but where is the link to join the gb? "SKBXX GB ORDER FORM" at the top. Ahh I can see it on my pc but in Tapatalk mobile app it doesnt show. have anybody got a confirmation of their submitted order form through email? I did not get a confirmation email. I think this is really neat for EU boys looking for a solid cheaper custom, Well done. I hope you sell a bunch! sorry, no confirmation emails, don't worry. yep, you just choose a kit, avoids confusion. over on DT I was asked if it would be possible to order an extra plate. yes, possible, haven't thought about it jet. haven't jet figured out pricing for an extra plate. If I have, everyone will have a chance to decide on this later, so don't worry for now. 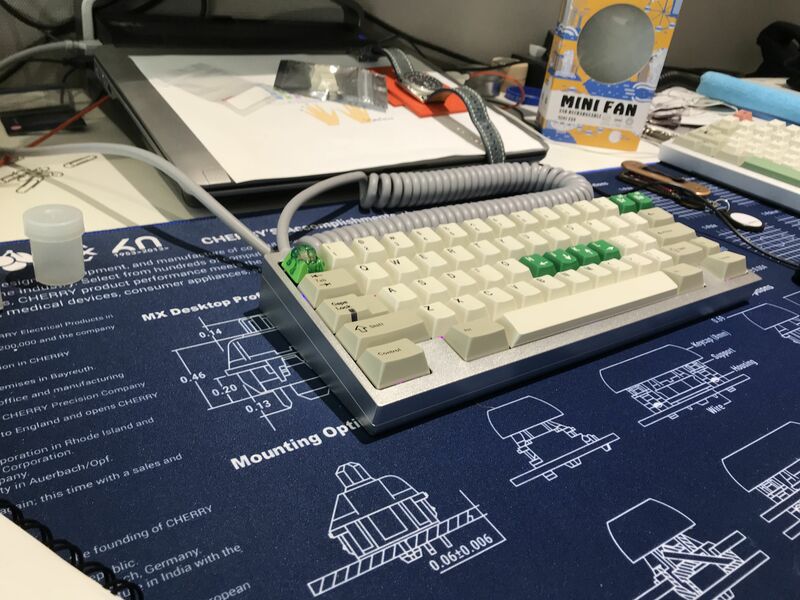 HHKB with split spacebar is my plan. Sorry, no confirmation email. Only later found out, that a plugin exists for that. It's a shame the shipping to US is so expensive - at this rate, I'll only be able to get in at 100 MOQ. How often can we expect updates on MOQ? Perhaps a proxy or two will do the trick to save on some shipping fee for US buyers? But the question is who can be a reliable proxy and is also willing to go through the trouble. I'm actually painfully ignorant on what it takes to be a regional proxy. Basically a verified local point of contact to receive the bulk shipment (lower rate from DE to US) and then coordinate individual shipping within CONUS? This is really awesome but I share the feeling with a commentor above about shipping price. 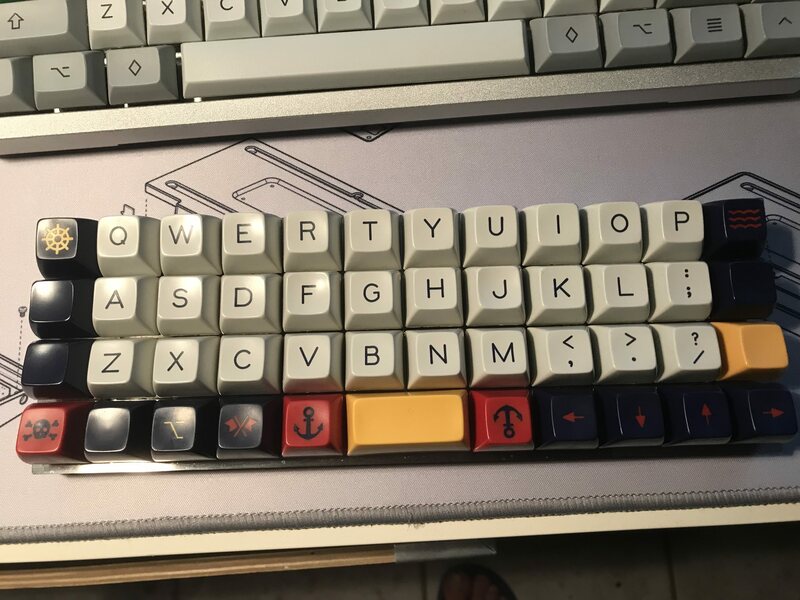 I will probably come in for a 60% at 100 but before that paying almost 30% of the boards cost in shipping feels pretty awful. Really awesome board though I like the visible screws. Maybe for the US a well-known company, such something like TheKeyCompany, could be used as proxy? An established "store" or a well-known member could do it, especially if they have before. Will have to see if any of the US based vendors end up getting in on the GB themselves personally, and see if we can bait/lure them into being a proxy. Isn't Donutcat a 75% lover? How do you summon people on GH (I originate from rmk so not brushed up on forum tricks). I would love to join but 40EU for shipping prices me out. yes, shipping to the US isn't cheap. also the euro to dollar exchange rate has changed quite dramatically over the last year or so. before that it would have been a steal for US buyers. at the moment UK buyers are in a really nice position, shipping is not that expensive and the exchange rate is in their favor. Would you entertain the idea of a US proxy if there are enough orders? Also, do the MOQs given include all layouts/sizes or is that MOQ per size/layout? Glad this is getting a lot of traction so quickly! lets see if enough US orders come in. if it turns out to be a lot then a proxy makes sense but not for just a few orders. well, same, lets see first if there is a critical mass of US orders. a vendor would be great of course cause trust and they know about shipping. yes, if orders are enough. well, MOQ is said 40, i meant overall, but it would be a disaster for me. prices were supposed to be higher but i got scared before posting that after all the time, interest might have faded so I went as low as possible to make it happen. also I haven't mentioned that every single version needs to be produced at least 10 times (which is crazy low, anybody who has a clue knows I can't make no profit with that). it looks like we get at least 10 for all versions, let's hope it will get more over time. 50 overall for the first 24h is good I guess. 50 orders already. Nice! 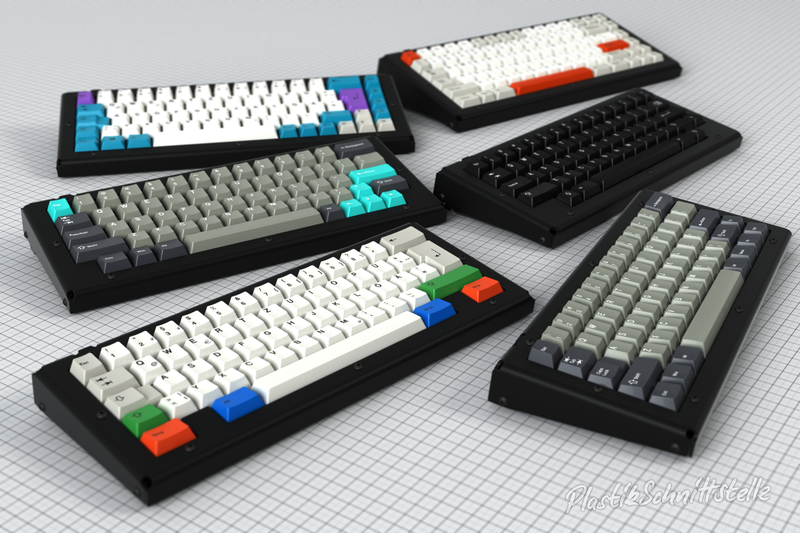 So, in essence, each layout/variation would require 10 orders to get any cases produced at all? At this rate do you see the GB closing and invoicing beginning at the estimated time of 2018-04-26? Why close early just because MOQ met? It is literally the Minimum of Quantity, so wouldn't it be best for all involved to get highest numbers possible for max price breaks? Maybe more people can jump on or eat the shipping once it reaches price breaks. 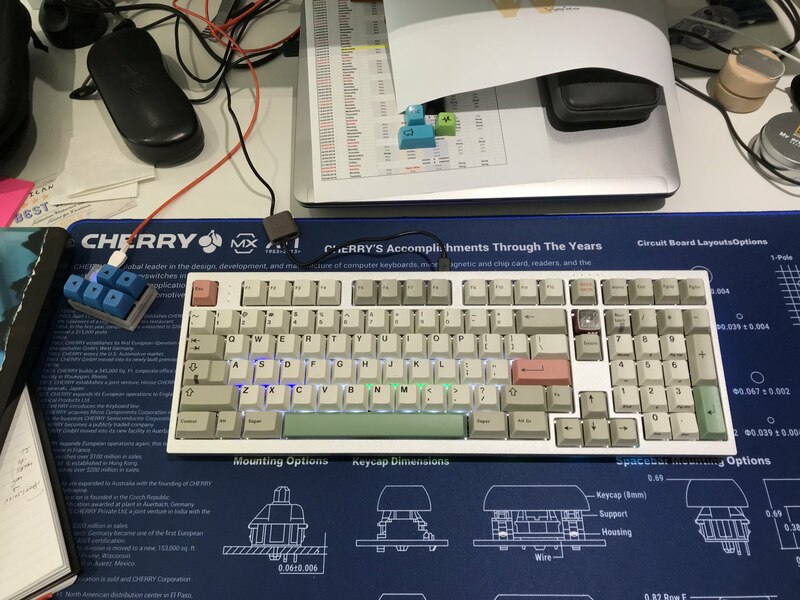 EU <> US is always super expensive unfortunately, but to be fair that's pretty much common for shipping keyboard size/weight parts anywhere around the globe. @Zuology, that's the planend date. But it seems like there's some wiggle room. I really hope I get more. that's why I will continue to work on it to get more orders. 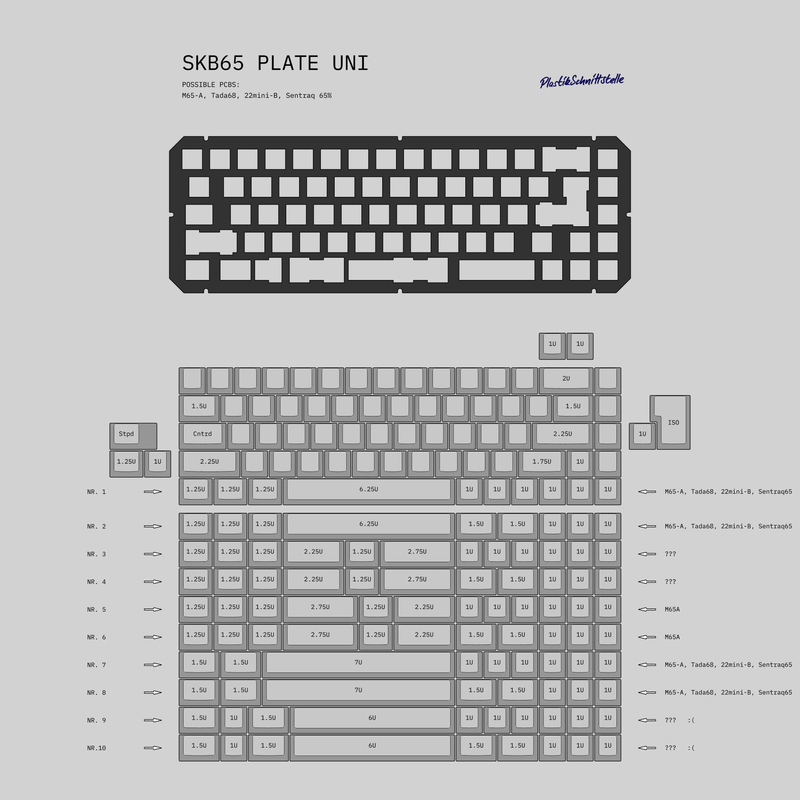 a few more renderings showing some more layout possibilities, a third build with different switches, hq photos and typing-demo/video. then a reddit gb post as well. i know, was mentioned there already there but i will make one myself as soon as i have good photos. but I won't be able to do it this week. kekstee just posted while i was writing this. 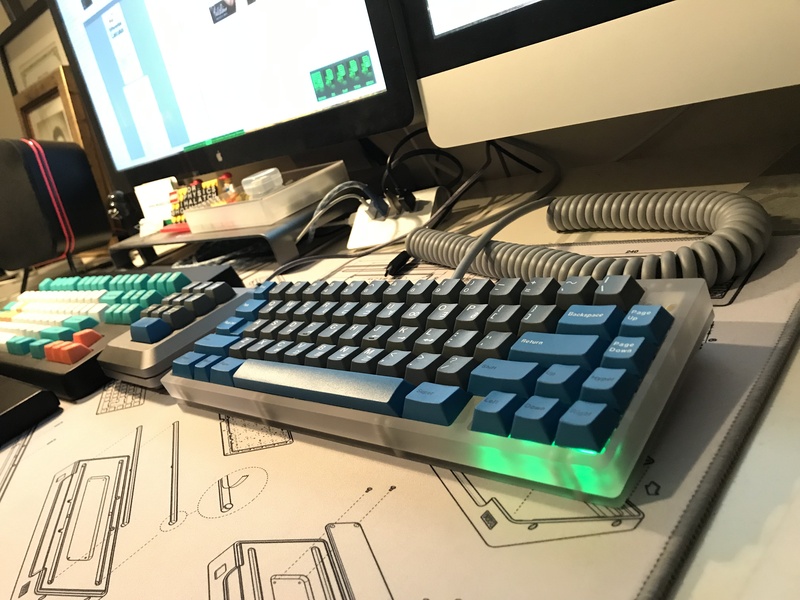 I created some unofficial posts to link back to this official thread to spread the word over on rmk & mechmarket. There's been a fair amount of response and people saying they've bought in. FWIW I let PlastikSchnittstelle about the unofficial posts and he is ok with them until he puts together the full board presentation. I really want to see this GB succeed and more people is more orders and less cost for a great product that is different from the more traditional customs out of asia. 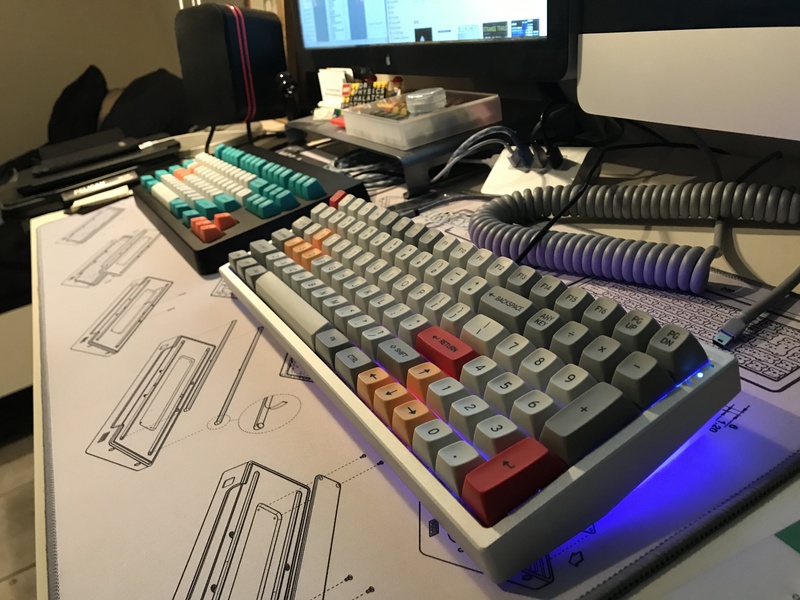 I think the BYO-PCB thing is great, the adjustability is unique, and industrial look is uncommon. 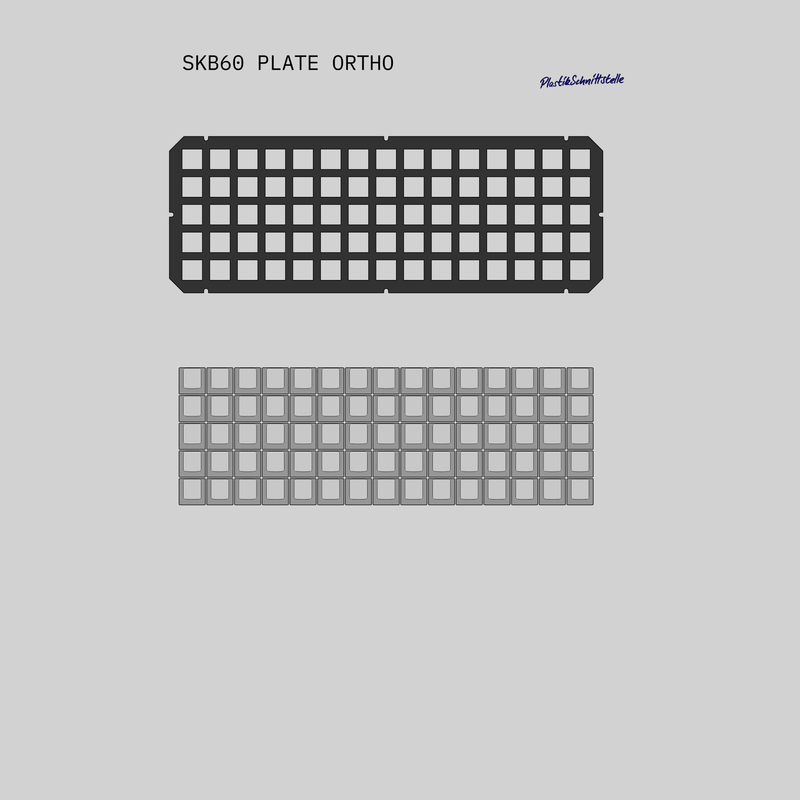 oh and also, over at DT someone asked for an ortho plate. please take a look if you are interested. might happen. yep, thanks a lot, this is a good solution as long i don't have the material I want to collect for an "official" reddit post. 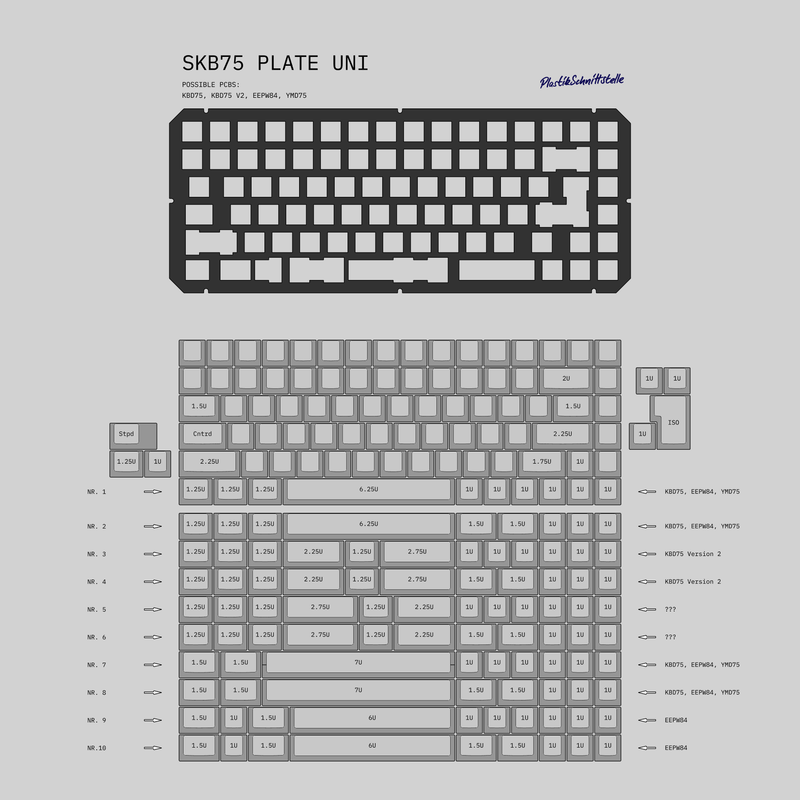 Ortho plate would be pretty straightforward to design and get cut in addition to existing layouts, I presume? also regarding the swap-sockets. you can always get shorter standoffs for my SKB case. now the plate is hold by 5mm standoffs wich makes the caps sink in by 2mm. you can just use 4mm standoffs instead or even 3mm and you would certainly have no trouble with swap-socket-PCBs at any angle. Does that mean we can just swap out the standoffs if we want to individually customize our setups with lower/higher mount with minimal effort (pending clearance from bottom of case)? Page created in 0.167 seconds with 73 queries.